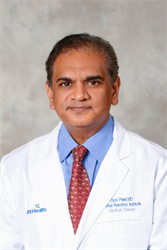 Vipul Patel, MD, FACS is the medical director of the Global Robotics Institute at Florida Hospital Celebration Health and medical director of the Florida Hospital Cancer Institute Urologic Oncology Program. He is a professor of Urology at the University of Central Florida College of Medicine in Orlando, Florida, and a clinical associate professor of Urology at Nova Southeastern University, also in Orlando. He is the founder of the International Prostate Cancer Foundation (IPCF) and a founding member of the Society of Robotic Surgery. He serves as an honorary professor at the University of Milan, Korea University and Ricardo Palma University in Lima, Peru, and was recently made an honorary professor of the Russian Academy of Science. He leads one of the world’s most experienced robotic surgery teams and travels around the world to educate physicians and care for patients. He is the editor emeritus of The Journal of Robotic Surgery and editor of the first-ever robotic urology textbook. Dr. Patel is world-renowned for his contribution to the field of robotic surgery and is committed to personalized patient care and quality outcomes. He is one of the most experienced robotic surgeons in the world and has personally performed over 11,500 robotic prostatectomies. Dr. Patel has developed techniques in robotic surgery that have translated to improve patient care and outcomes. His innovations have helped to improve cancer treatment and return of early urinary continence and sexual function. His contributions have been recognized worldwide through publications, professorships and training courses. He has traveled the globe lecturing and teaching. He has educated thousands of surgeons in robotic surgical techniques. He has started robotic surgery programs or performed surgery throughout the United States and in countries, including India, Sweden, Belgium, Venezuela, Turkey, Australia and South Korea. Dr. Patel previously served as director of the Robotic Surgery Program at The Ohio State University in Columbus, Ohio, prior to joining Florida Hospital Celebration Heath in 2008. During his tenure, he was also in charge of minimally invasive urologic surgery and associate professor of urology and bioinformatics. Dr. Patel is board certified by the American Urological Association and completed his residency and fellowship training at the University of Miami in Florida.